Planning a diet for cirrhosis can be a tricky issue due to your body's potential impairment to processing and digesting certain nutrients. Indeed, anyone with liver problems is strongly advised to seek the council of a professional dietician. Still, there are a number of common-sense steps you can take to straighten up your diet. Simply put, it's a gradual breakdown of the liver where healthy tissue is replaced by scar tissue and regenerative nodules (lumps) and liver function slowly erodes. Common causes include Hepatitis C, alcoholism and heart disease, though there are many other possible contributing ills that can cause it. One of the main challenges for cirrhosis sufferers is keeping swelling at bay, both in the gut (ascites) and the legs (edema). The key to accomplish this is to keep sodium (salt) intake low, since salt directly works to amass and retain fluid in the body. Ever notice how you get all bloated and carry a few extra pounds after cleaning out a mega-sized bucket of salty movie popcorn? That's the salt at work. Get rid of the salt shaker. Don't add salt to anything. There's enough there anyway. Make it a habit to scan nutritional information before buying anything. Opt for as much home cooked food as possible, focusing on vegetables and other low-salt ingredients. Conversely, avoid pre-packaged and restaurant food whenever possible. 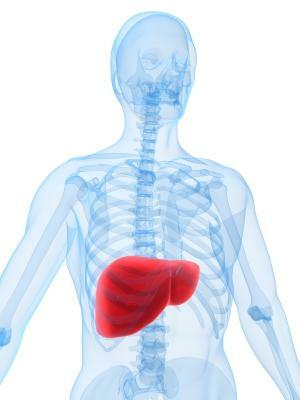 One nasty side effect of decreased liver function is the impact on how the body handles the absorption of fat. Or lack thereof, rather. If you consume a lot of fat, it may pass straight through, which is not good for reasons that are not limited to the field of nutrition. MCT, medium chain triglycerides, is a special kind of fat that doesn't require bile to be processed (a problem for cirrhosis sufferers). This makes it an excellent candidate for substituting more traditional fat sources, especially in conjunction with taking vitamin supplementation. The best part is that while MCT may sound strange, it is available over the counter and actually doesn't cost very much -- a 16 oz bottle from a respectable manufacturer can typically be found for under $15 with a few quick shopping searches online. Limit fat consumption to about 25% of your total daily calories. If you opt for an MCT-heavy diet, don't forget to take linoleic acid supplements too, since MCT lacks this vital fatty acid. As you probably know, some vitamins are fat-soluble while others are water-soluble. That means the absorption of the latter isn't affected by cirrhosis, while the former definitely is. Think about it as if the vitamins are piggy-backing on either fat or water into your system. What happens to the vitamins piggy-backing on the fat, if the bulk of your fat goes straight through into the john? Bingo. It's time to break out the jar of vitamin supplements.However, this is another case where it is highly beneficial to work with a professional. Some vitamins and minerals are downright harmful if overdosed, just like it's harmful to slip into a deficit mode, making it a very tricky balancing act when you have a condition like cirrhosis. A medical professional can order regular blood tests and manage your supplementation regimen based on hard facts--an infinitely better approach than flying blind and chugging random pills while hoping for the best. Finally, two things that are not regular parts of your diet yet deserves a mention since they have a direct impact on liver health.Pain killers in general put quite a bit of strain on the liver. For a normal, healthy liver, this is nothing it can't shake off relatively easy, just like a pro athlete can bounce back from a short bout with a cold bug in a matter of days. For an already stressed liver, however, it's like the equivalent cold bug hitting a 90-year old lady already in fragile health. Bottom line: Avoid pain killers just as religiously as you avoid alcohol. On a more positive note, Europeans have been using the herb milk thistle for hundreds of years for its liver-supporting qualities. It is now widely available in purified capsule form throughout the United States, and the scientific community is largely in agreement regarding it's positive impact on liver health. However, make sure to consult with your doctor regarding adding milk thistle to your diet for Cirrhosis, as some medications may have interaction issues with this kind of herbs.